Silver Spruce Resources (TSX-V:SSE) said exploration work continues to expand the known mineralized areas and has identified additional drill targets at the Pino de Plata project in Chihuahua, Mexico. The Oreninc Index fell in the week ending April 12h, 2019 to 28.46 from 39.79 a week ago as the number of financings shrivelled to a six-week low. Gold had a volatile week, surging higher only to suffer deflation to return more-or-less to where it started after suffering a 1.5% drap on Thursday as US consumer prices increased by a seasonally adjusted 0.4% in March, slightly higher than forecast. Analysts expect a recovery in the week ahead as the US Dollar Index weakened. On the political front, the US and China are still engaged in trade talks although an outcome still seems uncertain in terms of both timing and content. The European Union (EU) gave the UK an extension until October to decide how or if it wants to leave the block. There is growing pressure in the opposition Labour Party to back a second referendum and make it a part of its official policy going forward rather than just an option. On to the money: total fund raises announced decreased to C$40.1 million, a nine-week low, that included two brokered financings for C$3.0 million, five-week low and two bought-deal financings for C$3.0 million, a four-week high. The average offer size increased to C$1.8 million, a two-week high, whilst the number of financings decreased to 22, a six-week low. Gold began the week strongly increasing to US$1,307/oz before falling back to close down a smidge at US$1,290/oz from US$1,291/oz a week ago. The yellow metal is up 0.62% so far this year. The US dollar index pulled back as it closed down at 96.97 from 97.39 last week. The van Eck managed GDXJ closed down at US$31.13 from US$31.79 a week ago. The index is up 3.01% so far in 2019. The US Global Go Gold ETF pulled back again as it closed down at US$12.64 from US$12.82 last week. It is up 10.85% so far in 2019. The HUI Arca Gold BUGS Index closed down at 168.27 from 171.18 last week. The SPDR GLD ETF continued to sell off as its inventory closed down at 757.85 tonnes from 761.87 tonnes a week ago. It was last at these inventory levels in November 2018. In other commodities, silver spot fell below the US$15/oz level as it closed down at US$14.97/oz from US$15.11/oz a week ago. Copper gained ground as it closed up at US$2.94/lb from US$2.89/lb a week ago. Oil continued to see growth as WTI closed up at US$63.89 a barrel from US$63.08 a barrel a week ago. The Dow Jones Industrial Average saw a volatile week although it closed slightly down at 26,412 from 26,424 last week. Canada’s S&P/TSX Composite Index closed up at 16,480 from 16,396 the previous week. The S&P/TSX Venture Composite Index closed slightly down at 625.64 from 629.82 last week. Number of financings decreased to 22, a six-week low. Two brokered financings were announced this week for C$3.0m, a five-week low. Two bought-deal financings were announced this week for C$3.0m, a four-week high. Total dollars declined to C$40.1m, a nine-week low. Average offer increased to C$1.8m, a two-week high. Gowest Gold (TSX-V:GWA) opened a C$8.0 million private placement offering on a strategic deal basis with Chinese investment company Fortune Future Holdings. The financing is subject to the completion of a 10:1 share consolidation. Private placement 17.8 million shares @ C$0.45 on a post-consolidation basis (equal to 177.8 million shares @ C$0.045 pre-consolidation). Fortune holds about 19.8% of the outstanding shares. After the placement, it would hold about 43.3%. The proceeds will be used for the continued development of the Bradshaw gold deposit in Timmins, Ontario, Canada. It has an indicated resource estimated at 2.1 million tonnes @ 6.19 grams per tonne gold containing 422,000oz. Triumph Gold (TSX-V:TIG) opened a C$5.95 million offering on a best efforts basis. Each unit includes half a warrant that expires in two years. 17.0 million units @ C$0.35. Each unit is comprised on one share and half a warrant exercisable @ C$0.60 for two years. The proceeds will be used for exploration on its Freegold Mountain project in Yukon, Canada. Gowest Gold (TSX-V:GWA) opened a C$8.0 million offering on a strategic deal basis with partner Fortune Future Holdings. Sarama Resources (TSX-V:SWA) opened a C$4.5 million offering on a best efforts basis. Eastmain Resources (TSX:ER) opened a C$3.0 million offering underwritten by a syndicate led by Laurentian Bank Securities on a bought deal basis. Alphamin Resources (TSX-V:AFM) closed a C$15.96 million offering on a best efforts basis. Goldsource Mines (TSX-V:GXS) closed a C$7.48 million offering underwritten by a syndicate led by PI Financial on a best efforts basis. Aurion Resources (TSX-V:AU) closed a C$5.75 million offering underwritten by a syndicate led by Haywood Securities on a bought deal basis. GoviEx Uranium (CSE:GXU) closed a C$3.5 million offering on a best efforts basis. Several new veins mapped at Pino de Plata and analysed in real time by handheld XRF instrument. At Terrero-La Perla, the company has discovered a large area of highly altered rock which displays the strong argillic alteration commonly found at high levels of mineralized systems. Samples have run up to 557g/t silver, with lead, zinc and gold. 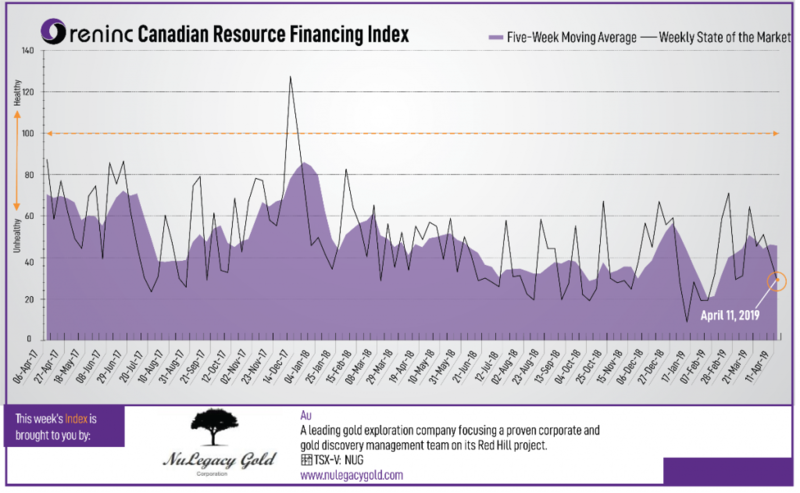 Silver Spruce also announced that Croesus Gold entered a Letter of Intent for a proposed qualifying transaction to become listed on the TSXV via reverse takeover. Completion of the transaction will provide Silver Spruce with C$100,000 in cash and C$250,000 in shares, under the terms of the sale of the Kay Mine project. Discovering new areas of potential for veins and expanded mineralized areas bodes well for the forthcoming Phase I drill program, with an increasing number of drill targets for the company to work through.